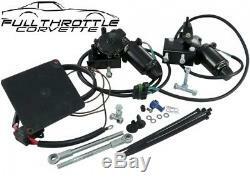 For sale is a brand new 1968 - 1982 Corvette Electric Headlight Upgrade Kit. This kit uses ALL NEW components, Including New Motors, UNLIKE the inferior kits listed that require the use of USED or Rebuilt Mazda Miata or Ford Probe Headlight Motors. Eliminate headlight actuator problems caused by vacuum leaks on your original headlight system. Make your headlights "POP" up and down just like the C4 and C5 Corvettes. Requires no cutting or permanent modifications to original equipment. No under dash modifications or connections. The operating module mounts on the LH wheelhouse. Drill two holes, that's it. All wiring supplied with Corvette gray and green wiring scheme and Delphi weather-pack connectors. All motor mounts and headlight actuator levers are powder coated black to compliment your engine compartment. Easy to follow instructions, very detailed with pictures. Complete package weighs less than 8 lbs. We carry a full line of Delco, GM, and Quality Reproduction parts and Accessories for Corvettes at Wholesale pricing. If you receive a damaged part please notify us ASAP. As you can see from our feedback we are 100% committed to customer service. If you're in the Atlanta area, stop by and visit our Showroom. The item "C3 Corvette Electric Headlight Conversion Kit. Fits 1968 1982" is in sale since Thursday, August 9, 2018. This item is in the category "eBay Motors\Parts & Accessories\Car & Truck Parts\Lighting & Lamps\Headlights". The seller is "fullthrottlecorvette" and is located in Lawrenceville, Georgia.